Written by poultry experts, Practical Poultry caters to the needs of enthusiasts of all levels from beginners with just a few chickens in the garden to established breeders. It covers a fantastic range of topics, ranging from incubation to housing and the techniques of breeding to get best possible results. As well as buying guides the magazine features wonderful photo galleries and its experts answer readers’ letters. 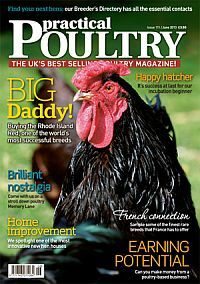 An essential monthly read for anyone interested in poultry. Published in English - Monthly. Allow 6-10 weeks for initial delivery. Practical Pigs is the first port of call for domestic pig keepers, both those thinking about keeping them and anyone who already owns pigs.